Hello! I am a local knitter who loves sharing my passion with others! I am a small business owner of an online boutique, however on occasion I do craft fairs as well. My boutique provides gift items for women, girls and babies. 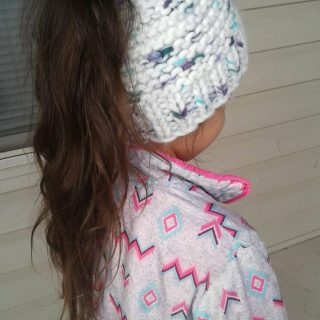 Some of the items I carry are fingerless gloves, ponytail/messy bun hats, beanie hats, baby headbands and baby booties. For your fur babies I do knit cowls! Througout this new year of 2019 I plan on adding adult cowls, slouchy hats, women’s chunky booties and some baby layette sets! For each newborn baby beanie hat sold, a hat will donated, and for each set of baby booties sold, a set will be donated to a charity/cause that is very special to our family! Thank you for taking the time to browse my shop!